Indications: poultry, calves, lambs, kids. 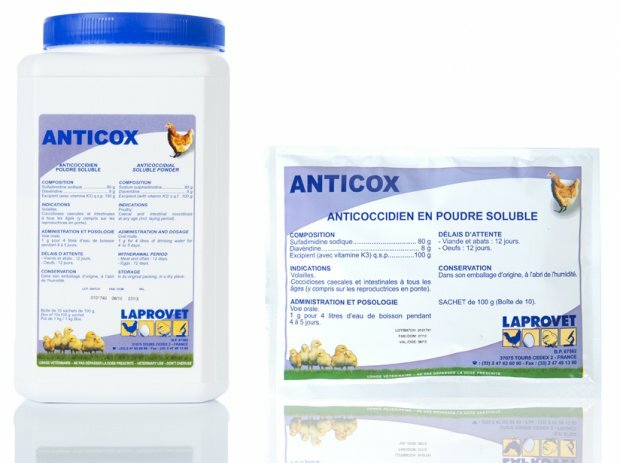 Treatment of cecal and intestinal coccidiosis (in poultry for all ages). Packaging: box of 120 sachets of 30 g. Box of 10 sachets of 100 g and 1 kg pot. Poultry: in drinking water for 5 days. 200 mg / kg body weight per day, or 1 g / 5 liters (1 bag of 100 g per 500 liters of water). Calves, lambs, kids: in Drenchers (mixed with drinking water or liquid food) for 4 to 5 days. 1 g/60 kg body weight per day.